With differently-abled staff and fusion Indian food, Echoes Cafe in Koramangala will give you an experience like nothing else, and get a few insights on non-verbal communication. Echoes has a beautiful, earthy vibe to it with wooden, brick and stone interiors all coming together. All tables are wooden and the most interesting thing is that all the chairs don't match, but work well with the vibe. From steel foldable chairs and wooden chairs typically seen in our government offices to crates with cushions, the varied seating lends to the relaxed vibe of the place. There’s a tree made out of wooden planks right in the middle of the cafe. They also have limited outdoor seating. Before we delve into the food, we must talk about what really makes Echoes stand apart. All their staff is speech and hearing impaired and the whole cafe is designed accordingly. If you need to call a waiter, there’s a switch above each table, that lights a bulb with your table number on it up. There are cards that say ‘Water’, ‘Bill’, ‘Fork’, and other basic things that diners are likely to ask for. Everything on the menu has a code, which you can then write down on a notepad to place your order. The whole staff is highly trained and it’s a lovely personalised experience. There is a chance you’ll want to learn sign language once you visit! We started off by trying the RedRave shake, a red velvet milkshake, and a Kit-Kat Shake which are absolutely delicious – thick, sweet and creamy. They’re a meal by themselves, to be honest. The Great Indian Mutton Sausage — sheekh kabab served with some onions in green chutney were soft and spicy as expected. 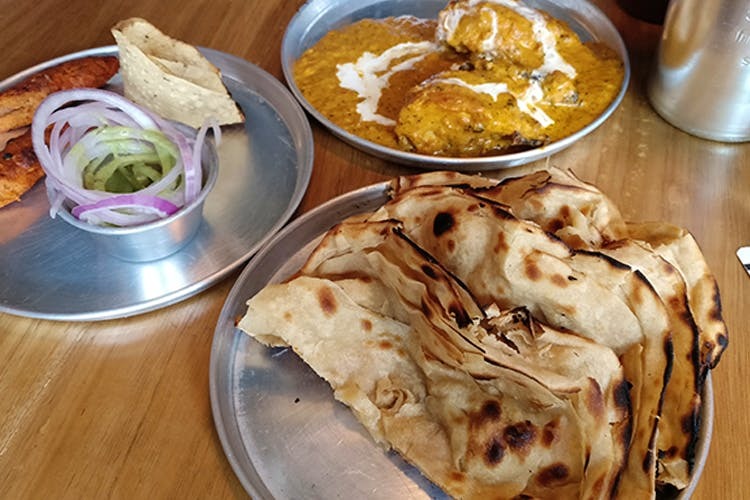 We fell in love with the two thalis we ordered – Classic Butter Chicken Thali that came with perfectly crispy lachcha paratha, and authentic butter chicken gravy, and the Raju Veg Tiffin Service that came with butter roti, fragrant and light peas pulav, the most delicious rajma and a creamy mattar paneer. You might think we were done but the food was so good, we had to try the pizza out. And the Farm Fight pizza was no disappointment, topped with all kinds of vegetables on a thin-crust, all made in-house!